Go to this page to see even more alphabet worksheets. 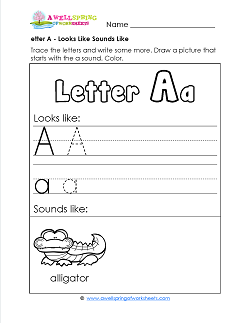 There's a wide-eyed alligator on this letter a looks like sounds like worksheet looking at you. He wants you to come write the letter Aa and draw and color an a word! What a brilliant idea! A letter b worksheet! Kids trace and write the letter Bb and draw a picture of a b word. What could be better? 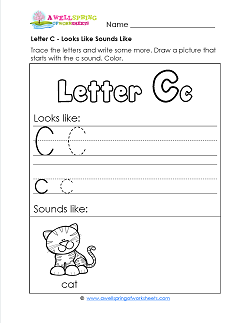 You and the cute cat on this letter c looks like sounds like page can do an awesome job writing the letter c and drawing a c word. Coloring is encouraged! There's a little doggie on this letter d looks like sounds like worksheet. He wants to help you write the letter d and draw a picture of a d word. Arf! Arf! There's an enthusiastic little elephant on this letter e looks like sounds like worksheet reaching out to you sayin', "Come on! Do this worksheet with me!" Now here's a letter f worksheet for your kids to practice not only writing the letter f, but also sounding out words that start with the f sound. A letter g looks like sounds like worksheet with a cute little giraffe encouraging you to write some awesome Gg's, draw a g word & do a great coloring job. This letter h page has kids write the letter h (looks like), then draw a picture of something that begins with the h sound (sounds like). In this letter Ii worksheet kids can practice writing the letter i, both capital I and lowercase i. Draw an object that begins with i. Have fun with this worksheet. The jellyfish on this letter j looks like sounds like worksheet will help you in writing the letter j and drawing a picture of something that starts with j. A special letter k worksheet just for you! Trace and write each Kk neatly and carefully. Draw a picture of something that starts with k and color the page. An awesome worksheet like this one will have kids write the uppercase and lowercase letter Ll and draw something that begins with L. Coloring is encouraged! 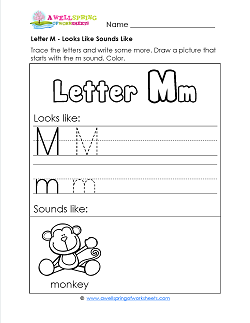 With a monkey waving hello, this letter m worksheet greets you with the opportunity to write the letter Mm and draw an m word. Have fun! How can you do better than this cool letter n worksheet? Kids write the letter Nn and draw something nifty that starts with N. Too much fun! On this letter p worksheet kids draw something that starts with p next to the cute little piggy, but only after they trace and write the letter Pp! A fun letter q worksheet! Kids trace and write the letter Qq and they get to draw something that starts with q next to the quail. Have fun! The letter r is really right on! Kids get to practice writing the letter to show what it looks like and then the get to draw a picture of of an r word, but not a rabbit because there's already one on the page! A letter s worksheet that combines letter tracing and writing with the sound of the letter. Think of a word that starts with s, draw it and color it next to the slithering snake! A nifty worksheet that combines tracing and writing the letter Tt with coming up with another object that begins with t. Drawing, coloring, tracing and writing letters all on one page. A neato burrito letter u worksheet. Kids trace and write the uppercase and lowercase Uu, draw a picture of something that starts with u, and color. This letter v worksheet has a picture of a vulture. Can your kids draw something else that starts with v? Trace and write the upper and lower case letters, too. The cute little whale on this letter w worksheet pulls you in with his cut grin. 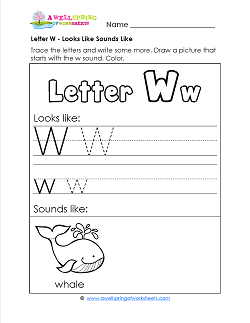 So go ahead, print out this page and have your kids write the letters, color the whale, and draw something else that starts with w.
A nice addition to your letter x lessons, this worksheet gives your kids the opportunity to write the letter x and draw a picture of something else that starts with the letter x. This is a great worksheet for putting together both what the letter y looks like and what it sounds like. Please have your students trace the letters and draw a picture of an object that starts with y. A fun worksheet for kids to practice writing the upper case and lowercase letter z. Kids can draw a picture of something else that starts with z.